Look, we all know someone suffering from an insatiable appetite for [insert vice here]. But if you've ever met someone who picked up the OG ADIXXION, you probably understand just how fixated on a single product one can become. Keeping the fix going is JVC, who has introduced the latest -- and perhaps most addicting -- ADIXXION yet. The GC-XA2 is obviously designed to rival anything in the space that GoPro presently owns, boasting a water-, shock-, dust- and freeze-proof enclosure and mounting options galore. Performance improvements in the new model include 1,920 x 1,080 60p/50p Progressive Full HD recording, and 1,280 x 720 high-speed recording at 120fps / 100fps for 4x slow-motion playback. ther upgrades include a brighter and wider-angle optical lens, improved image stabilization, a higher-resolution LCD monitor with auto-off and auto-brightness functions, a higher-resolution image sensor, a higher audio bit rate and better noise reduction. It'll start shipping later this month for a hair under $300... just don't go stealing from your mum in order to finance it, okay? WAYNE, NJ, July 9, 2013 – A new, upgraded JVC ADIXXION, the action camera ready for action right out of the box, was announced today by JVC KENWOOD Corporation. The new JVC GC-XA2 ADIXXION offers a range of performance and feature enhancements that boost image quality and versatility, and the camera remains ready for most any situation, no external housing necessary. Like the original ADIXXION, the new GC-XA2 is water-, shock-, dust- and freeze-proof – JVC's Quad-Proof design – with built-in LCD and Wi-Fi. Performance improvements in the new model include 1920 x 1080 60p/50p Progressive Full HD recording, and1280 x 720 high-speed recording at 120fps/100fps for 4x slow-motion playback. Other upgrades include a brighter and wider-angle optical lens, improved image stabilization, a higher-resolution LCD monitor with Auto off and Auto brightness functions, a higher-resolution image sensor, a higher audio bit rate and better noise reduction. The GC-XA2 also connects to Wi-Fi much quicker and can use itself as an access point for streaming live to a smartphone or to USTREAM, uploading to YouTube, and still image transfer. The new JVC ADIXXION app offers Quad View, among other features, which allows video streams from four separate ADIXXION cameras to be viewed simultaneously on a smartphone screen. With the ADIXXION's Quad-Proof Design the camera is waterproof to a depth of 5m (16.4 ft.), shockproof to withstand a drop from 2m (6.5ft), dustproof, and freeze-proof. The camera features a combination of shock-absorbent internal construction, watertight gasket-protected body casing, and a durable rubber outer skin. The body (including battery, LCD and Wi-Fi) is a lightweight 135g (0.3lbs), with mounting holes located both on the bottom and side for flexibility in mounting. 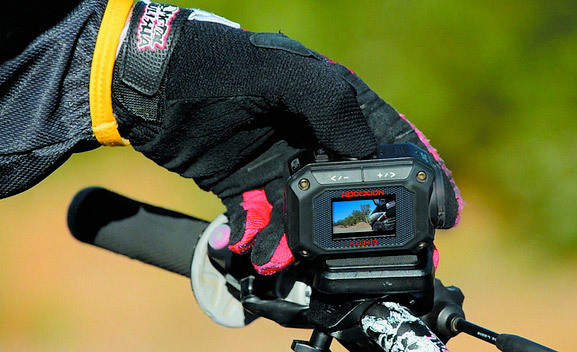 The GC-XA2 also offers time-lapse recording for photos as well as video. Burst mode takes multiple stills at up to 15 frames per second, and Simultaneous REC enables photo and video shooting at the same time. Creative functions include four built-in visual effects to spice up videos and make any situation look more unique and eye-catching. The GC-XA2 is fitted with an F2.4 lens with an angle of 137° at 1080p/720p/WVGA modes and 152° at 960p/still picture modes. The digital image stabilizer is improved through the use of a Gyro Sensor, which senses movements and adjusts the stabilizer to compensate. The image sensor is now an eight megapixel back illuminated CMOS, and the new LCD monitor offers a resolution of 115k pixels. The JVC GC-XA2 ADIXXION will be available in late July for $299.95. Headquartered in Wayne, New Jersey, JVC Americas Corp. is a wholly-owned subsidiary of JVC KENWOOD Corporation. JVC Americas distributes imaging and home entertainment products for the consumer market, and video equipment for the broadcast and professional markets. For further product information, visit JVC's website.